RESIDENTS of the 14 houses in Auburn Street, Dunmurry built a blockade of soil and stones to halt the flow of heavy delivery vehicles in January 1969. A spokesman for the street said: "It is the only way we can stop lorries using the road to deliver goods. And it will stay there until we fix the road ourselves." Residents said they could no longer get to their own homes because lorries delivering to a local store double parked. 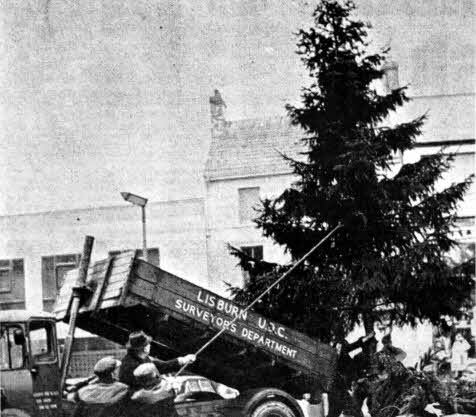 WORKERS at the Altona factory of Messrs. Short Bros. and Harland asked the press to giver more publicity to the threatened closing of the works at Lisburn, the Star reported in January 1958. The convener at the factory asked that the Altona problem be given as much publicity in (Northern Ireland as the Saunders-Roe and Malta Dockyard redundancy questions had received nationwide. A statement said: "With I the problem of 38,000 unemployed, can Ulster afford to have any more out of work?" 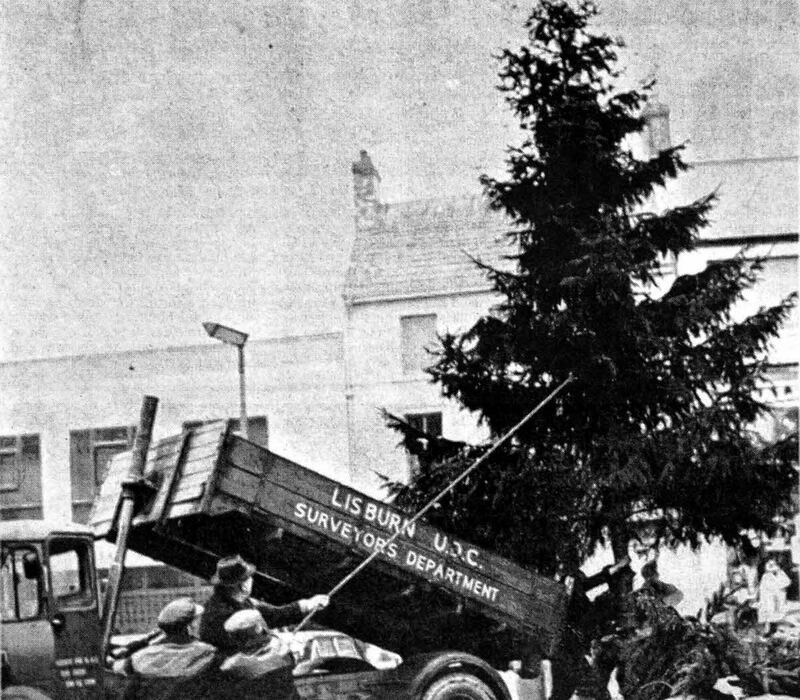 Timber...the Lisburn's Christmas tree Is removed from the centre of town after the festivities in 1966. WORK had started on the biggest housing development scheme ever undertaken by the Borough Council in January 1972 at Hillhall. When completed in approximately 72 months time, the development would provide homes for 400 families. However, there were already fears that the Hillhall Housing Development Scheme, which was costing £1.5million, might not solve the town's housing need after all. The Star reported that it all depended on the attitude of the newly created Housing Executive, which would shortly take control. When the scheme was first mooted five years beforehand, the idea had been to use the development to house those local people from the town's redevelopment areas. It was also the Council's intention to give a fairer deal to young married couples. However, the Council had since found it would have no say in the allocation of new homes. THE worst flu bug to hit Northern Ireland for 10 years was making an impact in the Lisburn district in January 1966, with a local doctor warning there was no sign of it easing. The epidemic, described as the worst to hit the Province since the Asian flu of 1957, had affected people in the younger age groups especially. The bug had resulted in depleted staffs m factories, shops and offices and local schools had also been badly hit. A check at schools in the Lisburn area revealed that in some cases the classrooms were half empty and members of the staff were also victims. It was reported that the seriousness of the situation could be judged from the number of school buses passing through the town with only about half a dozen pupils in them. Local businesses had also been feeling the effect of the epidemic and a spokesman for the Linen Thread Company's Hilden Mill described the position as "quite a serious problem" with a fairly high percentage of absenteeism in all departments. Lisburn Borough Council reported a number of flu victims and in the Lisburn Rural Council's area a fair proportion of the outdoor staff were off. 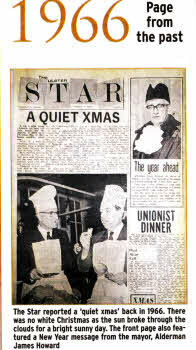 The Star reported that there were depleted congregations at various churches because of the epidemic. Doctors were said to be working 'round the clock, whilst chemists were 'snowed under' with prescriptions. The bug brought a feverish illness and a cough, but antibiotics were said not to do it any good. One good thing about the epidemic was that there were no complications and the victims generally recovered in about 10 days. The 'bug' seemed to be a new type and injections had no effect on it. One doctor said he had not heard of any deaths due to the epidemic. 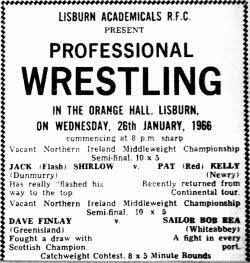 LISBURN Legion were kings of the green baize in January 1969. The local side brought the coveted Belfast and District Senior billiards league title to Lisburn for the first time. Champagne flowed freely in the Legion clubrooms after the match with Willowfield, as delighted local fans drank' a toast to the six Legion heroes. PLANS were underway for the formation of an 18 plus group , in Lisburn in 1969. Eighteen plus was a non-Political, non-Sectarian movement providing social and recreational activities for people between the ages of 18 and 30. Its activities included discussions, theatre trips, rambles, talks, dances, sport. debates, country weekends, socials, barbecues, car rallies, party holidays and social work. Organisers had had a good response since the announcement of the group in the Star.